Obverse: Imperial couple Dusan and Jelena seated, facing each other, cruciform scepter between them toppedwith lilly, each holding short scepter topped with St. Andrew's cross, СФb ZP (SF - ZR) to the sides. Reverse: Christ enthroned, holding Book of Gospels, lillies to the sides. Comment: King of Serbia from 8 September 1331 and Emperor of the Serbs and Greeks from 16 April 1346 until his death. Buried in Church of St. Marco in Belgrade. 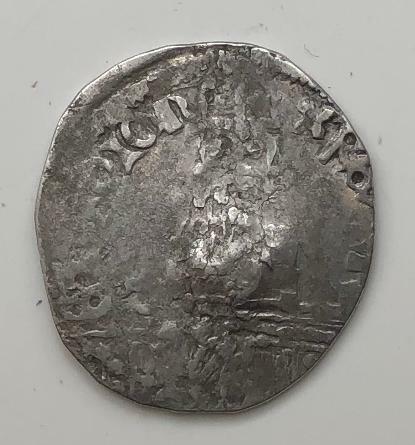 Extremely rare and scarce king and queenprofile type. Comment: Dušan conquered a large part of southeast Europe, becoming one of the most powerful monarchs of the era. Comment: Dusan enacted the constitution of the Serbian Empire, known as Dušan's Code, perhaps the most important literary work of medieval Serbia. Comment: Some historians consider that the goal of Emperor Dušan was to establish a new, Serbian-Greek Empire, replacing the Byzantine Empire. Ćirković considered his initial ideology as that of the previous Bulgarian emperors, who had envisioned co-rulership. However, starting in 1347, relations with John VI Kantakouzenos worsened, Dušan allied himself with rival John V Palaiologos. Comment: Dušan was the first Serbian monarch who wrote most of his letters in Greek, also signing with the Imperial red ink. He was the first to publish prostagma, a kind of Byzantine document, characteristic for Byzantine rulers. In his royal title, Emperor of the Serbs and Greeks, his claim as Eastern Roman (Byzantine) successor is clear. He also gave Byzantine court titles to his nobility, something that would continue into the 16th century. Comment: Serbian military tactics consisted of wedge shaped heavy cavalry attacks with horse archers on the flanks. Many foreign mercenaries were in the Serbian army, mostly Germans as cavalry and Spaniards as infantry. He also had personal mercenary guards, mainly German knights. A German knight named Palman became the commander of the Serbian "Alemannic Guard" in 1331 upon crossing Serbia to Jerusalem; he became leader of all mercenaries in the Serbian Army. The main strength of the Serbian army was the armoured knight feared for their ferocious charge and fighting skills. The Serbian expansion in the former territory of Byzantine Empire proceeded without a single major battle, it based on the blockade of Greek fortresses. Comment: Different throne from above with diagonal back. Jovanovic only has a drawing of this example. Comment: Early imperial type - King depicted with a more rounded crown. Comment: Early imperial type - King depicted with a more rounded crown. Clipped and withBulgarian counter mark. Interestingly Bulgarian counter marks only appear on Dusan coinage. Comment: Early imperial type - mainly full flan and not countermarked. Accomplished rendition of Christ, in the best "Ragusan style" characteristic of certain Rudnik mint issues. King depicted with a more pointed crown. Comment: Very rare and an early imperial issue (ca. 1346), possibly the first one with Latin legends; it followed closely the "coronation" type. Virtually all surviving specimens, rare as they are, are found in hoards near the Danube delta area (Dobrudja), where they moved with eastward commerce, and - though typically clipped and/or countermarked to fit the monetary system of the contemporaneous Bulgarian state - escaped the melting fate and entered local circulation. Reverse: Bust of Christ facing, holding akakia, sigla N-O to sides, IC XC above. Comment: Contemporary writers described Dušan as unusually tall and strong, "the tallest man of his time", very handsome, and a rare leader full of dynamism, quick intelligence, and strength, bearing "a kingly presence". According to the contemporary depictions, he had dark hair and brown eyes; in adult age he grew beard and longer hair. This coin is beautiful, popular and fresh design in the medieval Serbian series. Obverse: Dusan on horseback facing, crowned and in loros, holding cruciform scepter, Serbian initials: СФb ZP (SF - ZR), flowers on the bottom. 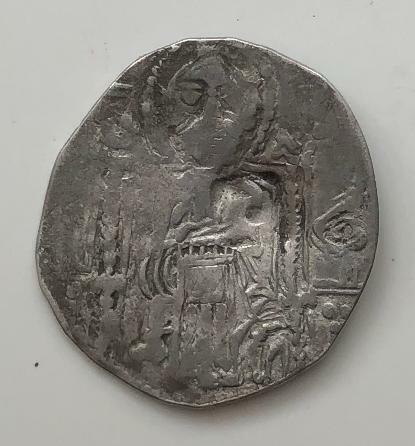 Reverse: Bust of Christ facing, holding akakia, IC XC above. Comment: Extremely rare and fresh design in the medieval Serbian series. Only Jovanovic had and featured this example with flowers. Next to example featured in his book this is only other known example. By his first wife, Helena of Bulgaria, Emperor Dušan had at least one child Stefan Uroš V who succeeded his father as Emperor 1355-1371. According to contemporary Byzantine historian Nicephorus Gregoras, Dušan also had a daughter: Theodora. Comment: Imperial couple Dusan i Jelena but empress has different crown from previous example. Comment: Dušan was the most powerful Serbian ruler in the Middle Age and remains a folk hero to Serbs. According to Steven Runciman, he was "perhaps the most powerful ruler in Europe" during the 14th century. His state was a rival to the regional powers of Byzantium and Hungary, and it encompassed a large territory, which would also be his empire's greatest weakness. By nature a soldier and a conqueror, Dušan also proved to be very able but nonetheless feared ruler. His empire however, slowly crumbled at the hands of his son, as regional aristocrats distanced from the central rule. Comment: An original design, issued in conjunction with the elevation of the state from kingdom to empire in 1345/6. Fine die-work by what is sometimes known as "engraver No. 2". Obverse double struck. Reverse: Christ enthroned, holding Book of Gospels, sigla П - O and IC-XC. Comment: He was first born son of King Stefan Decanski and Theodora, daughter of Bulgarian Tsar Smilac. His early life was spent in Constantinople, where as a youngster he spent around seven years (1314 to 1320). There he learned Greek, comprehended Greek life and culture and got clear view of inner value of Greek empire. He himself was more soldier then diplomat, as young man he excelled in two battles, defeating Bosnian ban Stefan II Kotromanic in 1329 and in 1330 Bulgarian Tsar Mihailo. He overthrew his father and then crowned himself as king on September 8, 1331. In 1332 he married Jelena, sister of Bulgarian Tsar Aleksandar, a woman of strong will, who had large influence on him and born him son Uros and one daughter. Dusan was the only real Tsar of Serbia, creating the Serbian Empire. Under his rule Serbia reached it territorial peak and was one of the largest states in Europe. Comment: Rare variant with crowned king faces on reverse on each side of the seated Christ. Obverse: Ornamented helmet with 3 feathers at the top. An inaccurate Latin inscription circling the rim. Comment: Possible contemporary counterfeit. Still rare as such.